1.The basic stitch is worked in the first row. 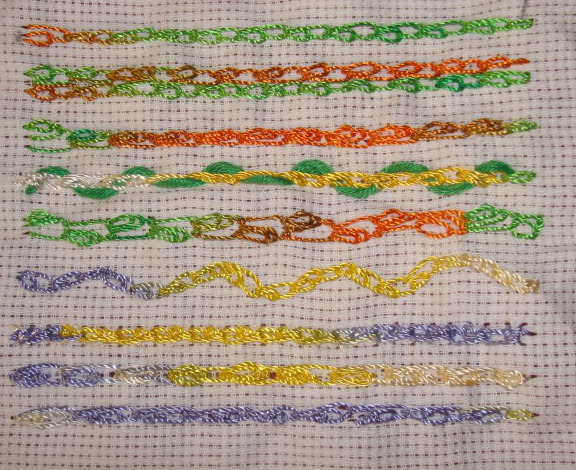 Two rows of this stitches are worked together in the second sample. One more stitch is added to the basic stitch in the third sample. 2.The first row is laced with six strands of cotton skein. The shell chain stitch is worked alternatively on both sides in the second sample. the stitch is worked in a curve in the third sample. 3. This stitch is worked on bars to get the effect of raised chain stitch in the first row. Instead of working the shell stitches on single chain stitch, they are worked on berry stitch in the second row.in the third row, the shells are worked on linked chain stitch in the third row. The version with Berry stitch makes a very rich stitch. I think, though, I like the row where you have alternated the sides of the shell (shellchst-2) best. You are right, I also felt the berry stitch looked heavier than the basic stitch. actually I had worked alternating the sides on my earlier sampler, but did not do it right, it looked like feather stitch variation.